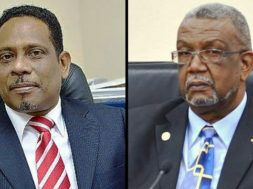 Udo Aron, Immigration Officer in St. Maarten (left) and Edson Kirindongo, Minister of Justice in St. Maarten (right). 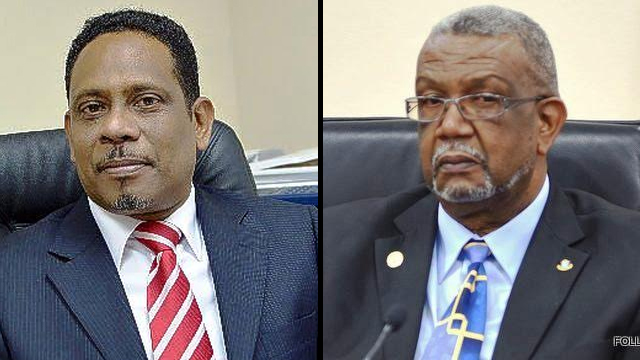 ST. MAARTEN (Aug. 12, 2016) — Director of Immigration in St. Maarten Udo Aron, on Wednesday, contested his June 25 suspension by Minister of Justice Edson Kirindongo, at the Court of First Instance. Aron was suspended for his alleged involvement in a case of human smuggling, in which he reportedly allowed entry to a woman from the Dominican Republic on May 5, 2016, who had no visa for St. Maarten. Aron was suspended after a month long investigation of the matter. On the day in question, Aron reportedly arrived at the Princess Juliana International Airport in the company of a woman from the Dominican Republic, and walked past immigration officers, informing them that he had the situation under control. Immigration officers did not comply with Aron’s statement and told him to follow correct procedures. After consultation with the Acting Head, Aron passed immigration with the woman. Immigration officials filed an official complaint, and after consultation with the relevant officials, Minister of Justice Edson Kirindongo ordered a full investigation. Aron is suspended pending the outcome of the investigation.